Update: The official release date seems to be the 3rd of November, but there are still unconfirmed rumours that the device is already shipping, although perhaps not in large quantities? I have a bluetooth keyboard and a bluetooth mouse, why do I have a wire running from my computer to my monitor? Well to be fair, I don't as I've got an iMac, but that isn't really the point. Supposing I didn't, and supposing I wanted to connect to my monitor without a pesky wire running between my computer and the monitor. Teq Gear's WID101 (via Gizmodo) is the first product that almost gets me what I want. Plug it into your monitor, and then you can stream your video data to the monitor, either over a wired network, or crucially, over an 802.11g wireless network. That means if you've got a wireless keyboard and mouse, your computer can actually be in a whole other room to you while you're typing away. Why? Well think about hanging a 30-inch Cinema Display on your wall, with your Mac mini safely tucked away out of sight. A bluetooth keyboard and mouse, and you're all sorted. Problems? Well yes, overlooking the fact that the mini can't drive a 30-inch monitor, the WID101 is as ugly as sin, and not that much smaller than the Mac mini itself. You're better hanging the mini off the back of your monitor and having it in plain sight than using the WID101. Oh, and it only works under Windows, there isn't any support for Mac OS X, or Linux for that matter. Presumably Teq Gear uses some Windows only software to take your video output, crunch it down, encrypt it, and stream it over your network interface to the WID101. There isn't much news coming out of Hawaii after the earthquake yesterday, but it looks like UKIRT and JCMT have come through intact. During the earthquake JCMT was doing an inclinometry run and Ian Coulson put up a page showing the effects (via Canspice). 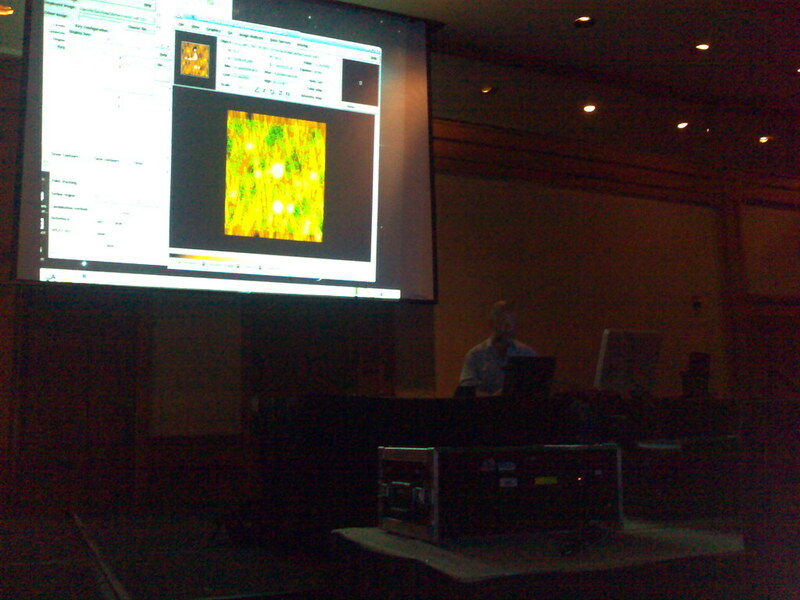 Update: More from day 2 and 3 at ADASS. I'm holed up in the Renaissance London Heathrow yet again, this time on my way out to Tucson in Arizona for ADASS. I've got a distinct feeling of déjà vu here for some reason..? Update: Finally managed to get out of LAX at ten past eight at night, about two and a quarter hours later than planned. Which put me into Tucson too late to do anything useful, but still too early to go directly to bed, despite it being around seven o'clock in the morning in the time zone I woke up in when I started the day. The rumours about a widescreen iPod have been circulating all year, and after a brief hiatus after the special event last month where we saw the iPod, iPod nano and iPod shuffle all updated, the rumours are back. This time Engadget is spreading the rumour that Apple is about to announce a wireless video iPod. The rumour makes sense, and the timing with respect to the holiday season and the launch of Microsoft's Zune would be perfect. Especially if the iPod's wireless support isn't crippled in the same way Microsoft has done to the Zune, a move which has attracted a huge amount of criticism. But that said, we've been talking about this for so long, does anyone really believe this stuff anymore? Today Nick Carr posted about Mike Arrington and about the possible conflicts of interest between bloggers, the companies they blog about, and their assumed responsibilities to their readers. For the A-list bloggers, people who are normally up to their necks in the Valley, and might have power to guarantee success or failure for a start-up, much as the old time theatre critics could do to a Broadway show, it's a thorny problem. We all know that Robert Scoble worked for Microsoft, and now works for PodTech.net, other aren't so transparent. But then, surely that's only to be expected? I think Nick is missing the point, these days we all expect biases in our media coverage, after all, only Fox News is fair and balanced..? I wouldn't take Mike Arrington's opinion as gospel, no more than I'd take Nick Carr's, or for that matter any blogger. The secret is very much in the sauce, read lots of view points and filter out the biased ones. Or not, read only people that agree with you. The choice, surely, is your own? In the spirit of transparency however; I run adverts from Google AdSense and am a member of both the UK and US Amazon affiliate programmes. I also a member of the TradeDoubler affiliate programme, and links to the UK Apple Store will go via that programme. ...the single most important piece of context information is this: You're holding a telephone. Most people don't know how to use their phone, and even if they do know how to use it, they mostly use it to make calls and (in the UK and Europe at least) send text messages. Nobody cares about MMS or, the holy grail of the 3G operators, video calling, and after the horribly broken first implementation, they don't care about WAP either. I'm one of the few people I know, and I know a lot of alpha geeks, that use mobile data seriously. Do you know how I find interesting new mobile sites? I use my laptop. Most of the stuff turned up by the current generation of search tools is either trying desperately to sell me something, or is desperately broken. If you want me to see and use your mobile site, put a prominent link on your normal website. Please don't use auto-detection as the sole method of figuring out that I'm coming from a phone or PDA, it mostly doesn't work. For instance my Nokia N80 advertises itself as "Safari" since it uses a Webkit based browser, and I'm not going to risk running up my data bill by loading your normal webpage on the off chance that you'll figure out I'm on a phone and send me a light weight version. So yes, I need a decent mobile search, but not very often. I'm also not entirely sure if everyone else needs it or not, what's your target market here? Are you looking for the early adopters and alpha geeks, or the man in the street? If the later I think you're in for an uphill struggle, they don't even think they need mobile data yet, to them they're still holding a telephone, and considering what's out there I don't blame them. Update: I'm obviously poking the holy cow with a stick here because I've had a sack full of email today about this, so lets make one thing clear, I still think that the next big thing will be mobile computing. The desktop paradigm we all live with today is dead, but mobile search? That isn't the next big thing, it might be next big thing three or four iterations down the line, but first we need some content. The acquisition raises a lot of questions, and you have to wonder how tightly the YouTube is going to get tied into the Google infrastructure. After all, they already have their own Video hosting service. Will YouTube be Google's Flickr and mange to maintain it's own identity, even under the newly extended corporate wing..? Another angle? Google is getting over its initial engineering-driven arrogance. You know the kind. Where when you show engineers... something like YouTube they answer "we can build that in a few weeks." Not invented here syndrome is endemic to the software world, far more than hardware, because after all lets face it, sometimes it's true. But most times people saying this are missing the subtleties, the many minor problems and off the wall solutions the guy that got there first had to go through to get his software working well. Just because you didn't invent it first, doesn't mean you should go out and re-invent it, not unless you're really sure that it's as easy as it looks. The corollary? With Google Video already rolled out, and as feature packed as YouTube itself, maybe Google found that they could re-invent the wheel, but couldn't bring the community that had built up around the YouTube to it..? 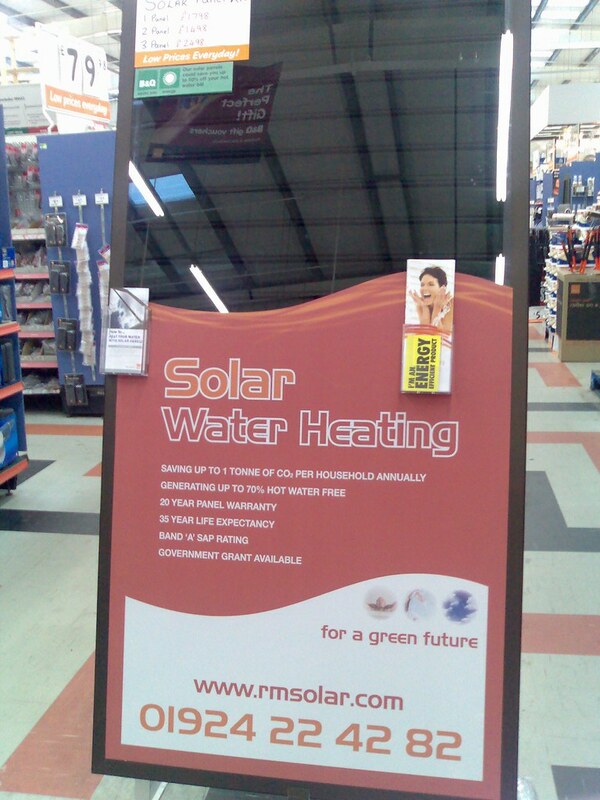 I was picking up some bits and pieces at my local branch of B&Q, for my American readers, think Home Depot, which is buried in the isolated heartland of rural Devon so I was fairly surprised to run across a wind turbine and a solar panel on display in the store. 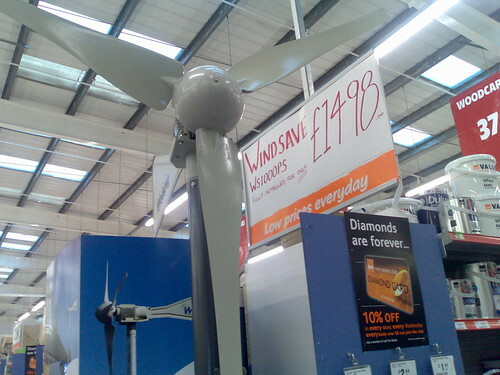 A wind turbine and a solar panel in B&Q, what next? I've talked about dropping off-grid and distributed microgeneration before, but this shows how mainstream these ideas are becoming, and gives me a little bit of hope that maybe we aren't done for after all. It looks like the folks over at Mactel Chat have come up with some solid evidence of Apple collaborating with Google (via CrunchGear) over the new version of iPhoto. It probably means that Apple is planning some sort of mashup with Google Maps inside iPhoto itself, which will possibly allow you to geotag, and then presumably display, your now georeferenced images. So today Nokia unveiled its Wibree standard, which in all honesty looks to be a head on competitor to Bluetooth, no matter how Nokia are tying to spin things. For a company that has amongst the best Bluetooth support in the industry, this came as a bit of a surprise, and certainly has a lot of people confused. I think they're facing an uphill struggle if they want us to dump our Bluetooth PANs and move wholesale to to the new standard. Virtually every bit of gear I own now has Bluetooth in one form of another, the installation base they're facing is huge, so Wibree will have to offer huge advantages or be able to coexist alongside the existing Bluetooth devices, somehow! Update: It doesn't sound like the guys over at Engadget are convinced by Nokia's spin either.